Born in Parma, OH, and a 2003 graduate of Brecksville-Broadview Heights High School, Sergeant Dennis Kancler enlisted in the Marine Corps in July of 2003. He began his career as a field radio operator and was assigned to 2nd Air, Naval Gunfire Liaison Company (ANGLICO) at Camp Lejeune. Sgt. 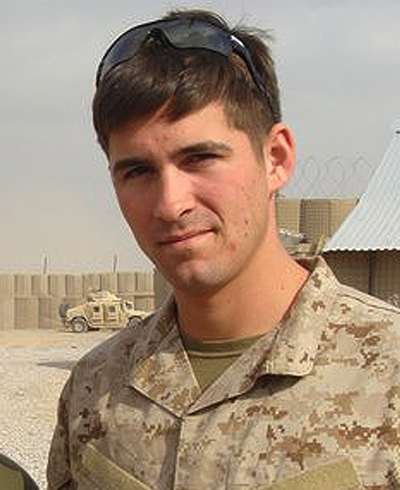 Kancler joined MARSOC in April 2008 and began training as a Joint Terminal Attack Controller. Sgt. Kancler deployed in support of both Operations Iraqi Freedom and Enduring Freedom. He was a basic airborne and freefall parachutist who loved to skydive, was savvy with electronics, and was an avid Ohio State and Cleveland Browns fan. Sgt. Kancler, while deployed with Golf Company, 2nd MSOB, had recently returned from a lengthy nighttime patrol when the barracks where he was sleeping caught fire. The morning fire killed Sgt. Kancler and two fellow Marines, and injured two others. Sgt. Kancler’s personal decorations include a Navy-Marine Corps Commendation Medal with combat V, two Navy-Marine Corps Achievement Medals (one with combat V), two Combat Action Ribbons, and two Good Conduct Medals.